Is any one brand truly better? 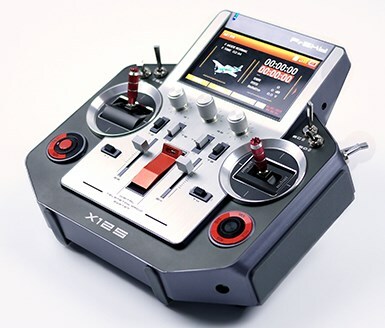 There are several popular RC radio (also called RC transmitters & RC controllers) manufacturers you can choose from when getting into the hobby. Futaba, FrSky, Graupner, Hitec, Jeti and Spektrum round out the six main contenders. There are dozens of other low cost, almost toy grade RC radios on the market as well; but I am focusing on quality hobby grade computerized radios. Ask ten different people, and you'll likely come up with ten different opinions, heated debates, and discussions. You see, most RC pilots are very passionate & loyal to the radio brand, and even model they use, more so than just about any other RC component. I'm sure you may have read or heard about the so called "brand specific crashes". You know, the Futaba radio users call them "Spektrum Crashes", the Spektrum or JR users call them "Futaba Crashes" and so on. Unfortunately there is little in the way of supporting data to back those claims up other than known faults with any one brand's specific model/s such as firmware bugs, a bad component, or initial release problems. For example, I personally would never be the first in line to get the newest model, for any RC radio brand until it's been on the market for several months. I'll let others beta & field test first before subjecting any of my birds to potential harm. As I said on my RC Radio Page, I would not hesitate to say that the majority of "phantom" crashes caused by these so called brand specific radio issues resulted from inadequate voltage/power issues on-board the aircraft, poor antenna placement, or from static discharge and not from radio glitches (assuming correct installation of components of course). 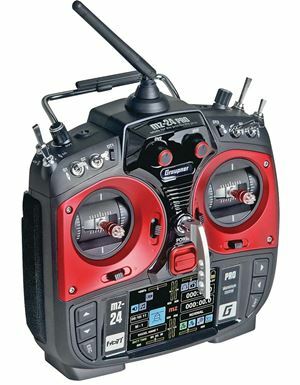 To be honest, all of these manufacturers build good RC radio systems, and brand loyalty seems to play more of a roll these days than function and performance when seeking purchasing advice. That said, FrSky and Jeti, do have the edge right now over the rest in my humble opinion. Interestingly enough, both those brands are on completely opposite sides of the price spectrum (FrSky being the least expensive, Jeti being one of the most expensive), dividing the rest of the field. In other words, no longer do you have to pay a premium price to get a good quality RC radio these days. Speaking of price, also take receiver and telemetry sensors (if the radio supports telemetry), costs into account. If you see yourself having (or already have), many RC model aircraft for example; choosing one brand over the other based on lower cost receivers and telemetry sensors can save you a lot of money. This Article I have on my site really dives into the technology behind today's modern 2.4GHz spread spectrum RC radios. It clears up much of the "marketing & brand "X" crash hype" out there. Sticking with the name brands listed above generally assures you get this build/component quality and then you just have to choose the radio model that has the specific features you're looking for while being within your particular budget. It could come down to something as simple, but ultimately very important, as how good the radio feels while you are holding it/using it. Is the switch and dial placement comfortable/intuitive? Is the gimbal placement and reach comfortable for your thumbs (or fingers/thumbs if you fly "pinch")? Is the display screen easy to see (low light & outdoors)? Does the radio feel balanced in your hands? Does the weight feel good? Does it have nice soft rubberized grips over hard, slippery plastic? Are the corners sharp and dig into your hands, or are they rounded allowing a comfortable grip? All these "ergonomics" play a big roll in radio comfort, usability, and ultimately, an RC radio you really enjoy flying with, opposed to one you don't even want to hold. In other words, if you have a hobby shop that you can visit, or know of someone in your area who has the radio you are considering to actually feel the radio in your paws before ordering/purchasing it; that can be a big advantage to choosing one you will ultimately be happy with. If you can't access that "hands on" RC radio inspection, use your "Google-fu". Do lots of research on the particular model/s you are considering to at least get an idea of what it feels like from other hobbyists who have the same radio/s. Consider the radio brand's "protocol." Most radio system communication protocols are not compatible with each other. This simply means each radio brand talks to the receiver onboard your RC aircraft in it's own "digital language" that is not understood by other brand's receivers. Radio choice is therefore a fairly permanent one. If you have several RC models for example that have brand A receivers in them and you later decide to convert to a brand B radio, you generally can't; unless you also switch all your receivers to brand B as well. Depending on how many RC models you have, this can be a very costly and time consuming conversion process. This again is why you want to take your time with your radio brand decision. So, let's have a look at them to hopefully help you narrow your RC radio brand decision down to one or two. I have and will always trust Futaba. I have rarely been let down by any Futaba product. Today Futaba really hits the mark on their intermediate to higher end products. 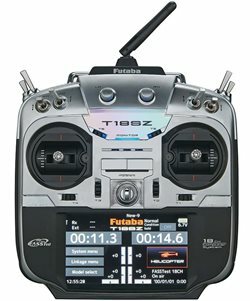 Their entry level 6J & 6K six channel computerized radios (at least for RC helicopters) are missing a few important features in my option, and are certainly built to a price point. Not near the quality in other words to their mid to higher level models. However, once you look past the 6J & K, their 2.4 GHz performance FASST series and very affordable FHSS series are some of the nicest intermediate & advanced radios on the market right now. As with most of the big name radio brands these days - the intermediate to higher end Futaba radio models support aircraft telemetry. Telemetry by the way allows you to get real time information back from your model such as voltage levels, RPM, temperature, RF signal strength, etc. It's the single biggest thing to have happened to RC radio technology since the in introduction of 2.4 GHz spread spectrum frequency hopping/shifting. Futaba has two distinct 2.4GHz spread spectrum protocols - FASST & FHSS which are not compatible with each other so that is the one thing to be aware of when choosing a Futaba system or subsequent receivers. Futaba S-Bus communication network is well supported by most high end flybarless systems on the market. 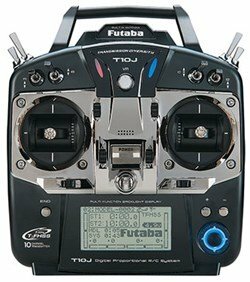 Click Here For Futaba Radio Deals On eBay. FrSky is getting to be a very popular RC radio brand for true RC enthusiasts who want massive configuration versatility with an array of receiver & telemetry options, while not breaking the bank or being locked into any one RF protocol. Impressive RC radio bang for the buck in other words. One radio to control FrSky, UHF, Spektrum, Futaba, JR, or other RF systems with the addition of the correct JR style "multi protocol" RF modules. 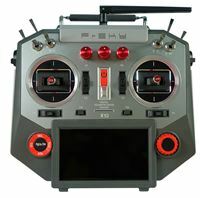 Many of FrSky's receivers also have Sbus outputs for easy connectivity to many of today's RC helicopter flybarless units and quad/multi rotor stabilization controllers. FrSky first gained popularity in the quad/multi-rotor world (both FPV & racing), but is now showing up at RC plane & helicopter flying fields in growing numbers world wide. Its latest frequency hopping protocol called ACCST (Advanced Continuous Channel Shifting Technology) is one of the best full range, telemetry enabled, 2.4 GHz spread spectrum protocols on the market today. The other big thing FrSky radio systems give you is the option to use open source software versatility (OpenTX) in combination with so many other high end operational features; costing roughly half to a third of similar spec established brands! They are not for everyone however. Configuration and programming can be complicated (even overwhelming at first), and included instructions are all but useless. You therefore often see poor reviews of FrSky radios because of this complexity by those that don't understand that these RC radios do have a steeper learning curve than most other brands. That said, there is a huge online help network if you don't mind putting some time into research or are already open source software savvy, and enjoy partaking in online knowledge help & sharing. OpenTX University is where most of us start out in our OpenTX learning journey, and a great site to visit to give you a good idea of what OpenTX is all about. 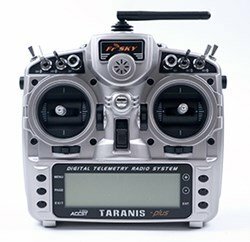 The fully expandable 16 channel Taranis X9D Plus is their most popular model right now, and at about $225.00 USD, outperforms radios that cost twice as much in terms of features, performance, and of course versatility. The X9D as some will have noticed uses a "copied" JR X9503/9303 shell giving it an outstanding feel and ergonomics. Overall build quality of the X9D suffers to some extent with breaking toggle & trim switches being the number one complaint. Lots of support out there however for fixing them yourself. Speaking of which, one of the nicest features with all FrSky radios is you can purchase repair/upgrade parts for them very easily. This is most certainly something none of the other big name brands allow you to do. Yep, even upgrade to hall effect gimbals if you so chose. The higher end 16 channel (expandable to 32) FrSky Horus X12S is one of the best looking, feature rich, RC radios on the market right now in my opinion. It's about the only radio that has come to market lately that truly excites me, yet is within my budget. I actually purchased this radio to replace my trusty, but aging JR X9503. Getting the display above the neck strap was what initially inspired my decision, but that is just one of its many attributes. I was certainly intimidated by the OpenTX learning curve and the hassle of having to convert all my birds over to a new system; but the versatility, cost effective telemetry, CNC hall effect gimbals, receiver options, voice, and high quality of this radio, not to mention the outstanding value and performance was so appealing. 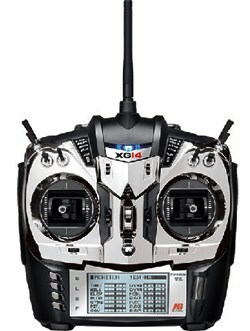 The Horus X10 builds on many of the features the X12 offers in a more "traditional" layout many will like better. The industrial high visibility color display is back to the bottom along with a slightly narrower stick placement. Again, one of the nicest RC radios for the price currently on the market in my opinion. For those of you who like the full tray style RC radios, FrSky has you covered with their 16 channel X9E. For those on a very tight RC budget, FrSky's basic line of Taranis Q series radios always get top marks. The FrSky Taranis X-Lite as you can tell takes its design insparation from the gamming community. 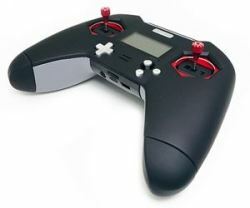 For those that love the feel of a game pad in their hands, the Taranis X-Lite is worth checking out. Graupner RC has been around for a long time and has a very loyal following stemming all the way back to 1930. They were based in Stuttgart Germany, but were purchased by a Korean company back in 2013 while still retaining the original name and expanding the product line. Graupner radios are of exceptional value and decent quality very similar to that of FrSky. Their 2.4 GHz spectrum protocol is called "HoTT", which stands for "hopping telemetry transmission". As the name implies, telemetry is standard on on their new models, along with touch screen displays, and programmable voice alerts. I'm not a fan of touch screen on RC radios, but we all have different likes and dislikes. Definitely a brand to check out if you're looking for good value, telemetry, and touch screen displays. Hitec was left behind when 2.4GHz Spread Spectrum Modulation was introduced; but Hitec caught up to this technology and has a small, yet decent lineup of computerized radios which comprise the Flash 8, and Flash 7. Hitec has made solid quality & reliable radios with very good spread spectrum protocol (currently running 2nd generation AFHSS). Their Aurora 9 was was one of the first reasonably priced radios on the market with telemetry several years ago which set a bench mark for others and first started the RC radio "telemetry revolution". 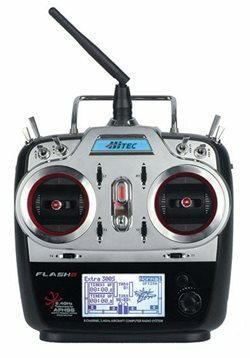 Hitec radio's are considered by some to be rather dated and limited in features these days compared to the latest offerings by Futaba, FrSky, Graupner, Jeti, and Spektrum. Still, the quality and value is decent; plus they have very nice big clear high contrast displays, and very nice ball raced gimbals. I do have to wonder given HiTec's limited base and following, if they will be the next RC radio brand to fade into the history books? Jeti Duplex are a relatively newer high end RC radio manufacturer out of the Czech Republic and are a favored brand now in the RC helicopter and jet world; with a rapidly growing customer base that are converting over from the likes of Futaba, JR, Spektrum, and HiTec. A small company that competes, even outpaces, the big players always grabs my attention and Jeti is no exception. They too have some of the nicest looking & high quality radio's on the market right now in my opinion, and it's pretty easy to see with their $2000.00 flagship DS-24 Jeti radio, where FrSky got its inspiration when creating the $500.00 Horus X12S. 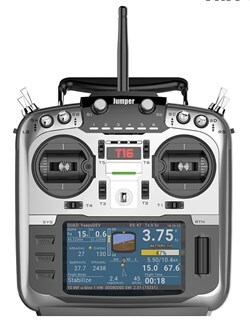 Jeti has high end features such as CNC gimbals with hall effect sensors, top notch quality toggles & switches, a full array of telemetry options, dual redundancy, and a wonderful feature rich user interface firmware. If you have deeper pockets and want what many consider to simply be the best RC radio system out there right now, Jeti just may be the RC radio brand for you. As I already mentioned, my go to radio up until I got the FrSky Horus in 2018 was the JR X9503. I've had it for just over 9 years (still use it from time to time) and it has never let me down once. 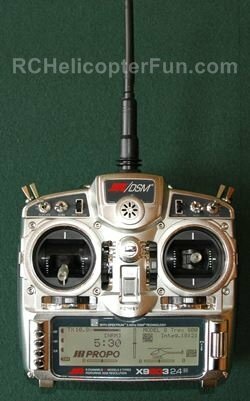 A good flying buddy; and without question, one of the best feeling radios in your hands. Like Futaba radios, JR Propo had been in the RC game for as long as I can remember and has a loyal following. JR has traditionally built very high end products that have been used by many professional RC pilots world wide; and in the RC heli world, was the number one choice for many years. JR then went to its own unique spread spectrum protocol called DMSS (Dual Modulation Spectrum System). This new system is not compatible at all with the Spektrum shared DSM2/X. Unfortunately, rumors were abound in late 2016 that JR might be going out of business, and this was confirmed by JR in April of 2018. So, another major RC nameplate that I & many others grew up with, is the latest casualty in our ever changing hobby. Jumper is a fairly new, low cost Chinese brand that is trying to eat into some of FrSky's popularity. Their big claim to fame is coming with an external "multi-protocol" module meaning you can basically fly almost every brand RX and RTF RC aircraft with their radios. Their very low cost and small size T8 & T12, are not far off toy quality. No serious RC hobbyist would take a second glance at them; but they are proving to be fairly popular in the world of low cost micro RC. However, their new full size 16 channel T16 is another story! It's pretty easy to see who/what inspired the design - yep the Futaba M&TZ's. Hard to mess the outstanding ergonomics up there, and that alone is reason to take a second glance. Exactly the same way FrSky's X9D has been so popular being based on the outstanding ergonomics of the JR-X9503. Multi-protocol out of the box and able to run open source (Open TX for example), with color LCD display, running on 2 18650's or 2S LiPo, for only $150 USD, has the potential to become a game changer in our hobby. I'm going to be keeping a close eye on this radio since it may change the way we all look at low cost radios - trust it or junk it??? 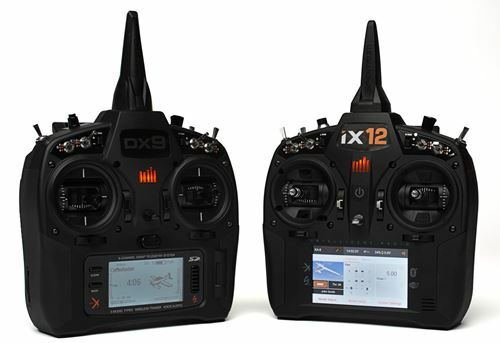 The Spektrum DX9 & iX12. Love em or hate em, Spektrum continues to dominate the 2.4 GHz RC radio market. This is not because they are any better than the rest, they just build a solid product with features & ease of usability most average RC'ers are after with decent pricing and great product support. They are also the main brand carried at most RC hobby shops so they simply get more exposure. Spektrum was after all, the first to the spread spectrum game over 10 years ago (at least in the hobby grade RC radio market), and they won a loyal dealer and customer following that continues to this day. 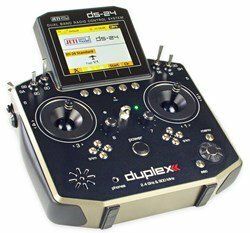 Spektrum continues to improve their products with features such as quad bearing gimbals even on their entry level low cost DX6, and come out with cutting edge features before many other brands do such as SD card support and voice alert first seen on the DX9. Spektrum wins out hand down from an ease of use, integration, and convenience standpoint offered with Horizon Hobby's BNF (bind and fly), Blade and eFlite aircraft. They all work with Spektrum's DSM2/X protocol, and that is the other big reason Spektrum is so popular and makes a good no-nonsense choice for many. Spektrum also has a large number of receivers along with their AS3X receivers with built in gyro stabilization for both fixed wing and helicopters, giving you lots of RX options. Moreover, most of today's good FBL systems support Spektrum satellite receiver connectivity and that too is a really nice feature. Spektrum is not up to the overall quality or has as many features of the pro/higher end Jeti and Futaba radios; but you also don't have to remortgage your house to purchase one. Their flagship DX20 is getting up there at over $1200 bucks however, and I personally feel once up to that price point, you could get a Jeti DS16 or Futaba T18 and be much happier if you don't need compatibility to Horizon Hobby's BNF aircraft. On the flip side of that, their DX8e represents amazing value considering all the features it offers. 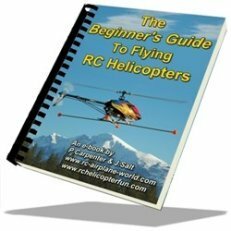 Are You Looking For More Specific & Detailed RC Helicopter Information & Help? Have a look at my eBook offerings. Are you getting into the hobby and have no one to help you out? Are you feeling overwhelmed & confused? Are you tired of wasting time seeking partial and conflicting information on the internet? Is crashing due to not fully understanding helicopter setup turning you off the hobby? Are you simply ready to give up? 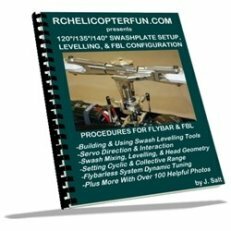 My RC Helicopter eBooks are here to help you with those exact problems. My most popular eBook! 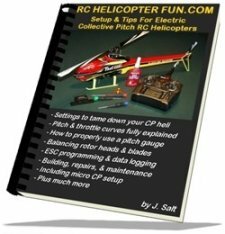 Setup & Tips For RC Helicopters. This is last video in the 3 part Devil 505 RC helicopter project. Final ESC setup and first test hover. This is the second video in the 3 part series that goes over the basic build process. I recently purchased one of those ALZRC Devil 505 Fast RC Helicopter Kits. Here's the 1st video in the 3 series part.